After putting an outstanding performance for his team Free State Stars, Mohammed Anas earned the award for man of the match. Blunders while delivering speeches can be crucial, but at the same time, they can be hilarious, too (of course for the people hearing). In a similar incident, Ghanaian footballer, Mohammed Anas, in what can be called as a ‘huge brain fade’, made a hilarious blunder, when he accidentally thanked both his wife and his girlfriend in the same speech. Mohammed Anas, 22, after putting an outstanding performance for his team Free State Stars earned the award on Friday night during the South African Premier Division match. Fresh from scoring twice in the 2-2 draw with Ajax Cape Town, Anas got somewhat carried away. Mohammed Anas scored two goals plus an own goal during his interview ???????????????? Vote of confidence on Mohammed Anas to lead South African men ????????????... More life to the guy ???? I suspect Mohammed Anas drinks @SavannaCider. It takes some serious apples to be that honest. Two goals, two girls. Mohammed Anas ???????????? Good morning to Mohammed Anas, his wife and his girlfriend. @Takshak_Speaks @garyalsmith @clydegoal aaj wife aur girlfriend donu se pitega ???? @garyalsmith @clydegoal I smell trouble... next game unavailable because of domestic injury? Mohammed Anas - Just wanna check when is his funeral? 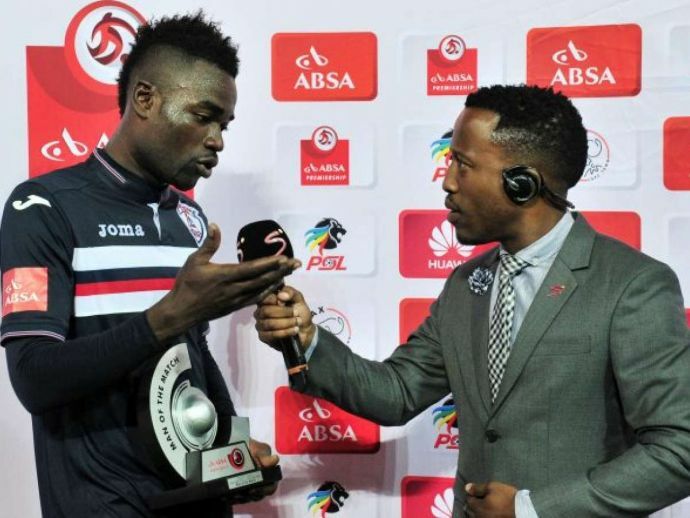 Free State Stars' Mohammed Anas gave the greatest post match interview of all time. Legend.